Every spring the radio and television commercials hit the airwaves. Seed companies running advertisements that guarantee you’ll have a thick, lush lawn in 2 weeks. Spring seeding almost guarantees a lawn full of crabgrass in July! Seeding can’t be done until soil temperatures come to a consistent daily temperature of around 60 degrees. Unfortunately, these are the same temperatures at which crabgrass germinates. When we seed in spring, and do our best to ensure ideal growing conditions for our newly sown grass, we also create a great growing environment for crabgrass. The problem is that we can’t put down a pre-emergent crabgrass preventer. It will prevent our seed from germinating too! Broadleaf weeds also compete for your lawn! The warm nights and warm days of spring are the best growing conditions for weeds…not so much for grass. Where there is open space in your lawn, dandelions, plantain, clover and ground ivy will find it. And spraying weed killer on weeds where new grass is growing can kill the grass. The grass just isn’t mature enough to resist the chemicals. If the weeds don’t get you, the dog-days of July and August will! In high heat, the cool season grasses of the northeast have a tendency to lapse into dormancy. If your grass is 2-3 months old, it’s still in its infancy! It doesn’t have the root system to go dormant…it just dies. 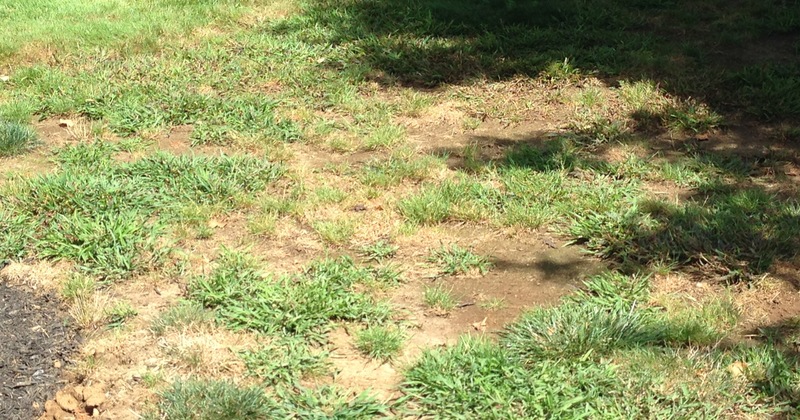 Surviving the heat and humidity of July and August requires mature grass with established, deep roots. This is when temperatures are ideal for growing new grass…warm days, cool nights and lots of dew! For customers that won’t take no for an answer, we tell them seeding in the spring always requires you to seed the same area in the fall; you’ll spend that money twice! You will love the new grass until early July and by August you will realize the broken promises of spring seeding. Fall…It’s the best time to seed your lawn. Save your money and let’s wait until then! A 2015 survey by the National Association of Realtors concludes the best way to boost curb appeal for your home is through the landscape. Beyond the house itself, the landscape is the first thing visitors see when arriving at your home. And bumping right up against the edge of the curb?… is your lawn. Even with a minimalist landscape, a well-maintained lawn provides a natural, eye-pleasing and welcoming approach to your home. The cost of a lawn care program including regular mowing, fertilization, weed control and watering can return as much as 300% of that cost in additional home value. And more importantly, it’s a positive draw to your home. The last thing you want is a visitor, or potential buyer, to be turned off by your landscape. Growing grass takes 10 months! Not 10 days, or 10 weeks. As counter-intuitive as it may sound, cool season grasses, the kind we grow in the Northeast, grow during the “cool season”… that’s September to June around here. That’s why it’s best to seed in early Fall. This is when temperatures are ideal for establishing new grass and strong root growth. Surviving the heat and humidity of late-June to early-September requires grass that has had 10 months to mature through the cool season. Seeding in the spring always requires you to seed the same area in the fall; you’ll spend that money twice! Start a lawn care program now! A 6-step fertilization program that controls crabgrass, broadleaf weeds and insects, along with lime applications to manage the soil pH and you’ll be well on your way enjoying your landscape and enhancing the appeal of your home. Lawn Care and the “Organic” Lifestyle? A focus on protecting the natural elements of your immediate environment. Do you limit your landscape to only regional native plants? Do you allow a portion of your landscape to remain undisturbed to conserve biodiversity? Do you use only organic mulch in your landscape beds? Minimizing the use of fossil fuels. Do you drive a hybrid or electric vehicle? Do you manage your thermostat to use less natural gas or heating oil? 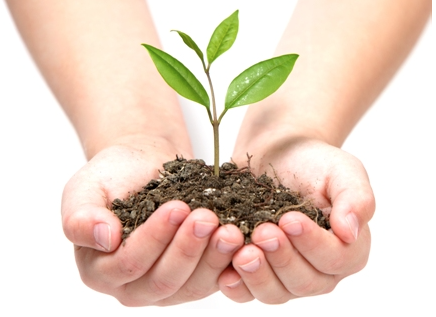 Have you landscaped your property to reduce the energy use of your home? Using only locally sourced products and foods. Do actively purchase from local growers and farm stands? Do you focus on food labels to ensure only natural products are contained in packaged goods? Practicing the law-of-returns through recycling, composting and reclamation. Do you have a rain garden? Do you recycle grass clippings back into the lawn? Do you compost or create your own compost tea to improve soil health? OMRI is a nonprofit, 3rd party reviewer that certifies products and materials as organic. Customers that live an organic lifestyle generally have clear goals and expectations of what an organic lawn care program can achieve for them. They recognize the long term benefits that can be realized with organic lawn care. Maintaining proper soil pH is the easiest way to prevent costly lawn problems. It can eliminate the need for expensive fungicides, insecticides and other unnecessary pesticide use in your landscape. Many homeowners with poor performing lawns have called us for a free lawn evaluation and estimate, and in most cases the problem is low soil pH. Low soil pH contributes to thin, patchy, discolored turf that is highly susceptible to disease and insects. Grass requires a soil pH of 6.0 to 6.5. That’s a slightly acidic environment. Ensuring proper soil pH will make the most of your fertilizer program. When pH is optimal, the grass can absorb the necessary essential nutrients in the soil to maintain a healthy strong plant. At low pH, essential nutrients become locked up in the soil and unavailable to be absorbed by the grass. This includes the naturally occurring macronutrients in soil and the nitrogen we apply as part of the fertilizer program. 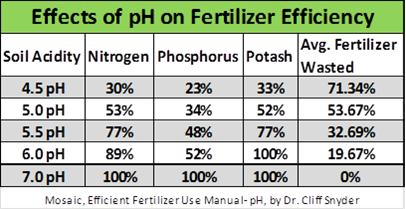 The below chart outlines the effect of pH on nutrient uptake by grass. The management of soil pH is critical for maintaining a thick, lush, weed-free lawn. This can only be accomplished through the application of limestone to your lawn. At Green Edge, lime is a key component of your lawn care program. What are the Benefits of Turf Grass? Bet you didn’t know all of the benefits the miraculous properties of turf grass can do for you, your home and your community. Here are some of the reasons you should believe in the power of your grass! Like all plants that use photosynthesis to create energy, the byproduct of that process is a certain gas that we cannot live without – oxygen. But in addition to that, turfgrass cleans our atmosphere. It filters pollutants and it captures and suppresses dust. Turfgrass improves the energy efficiency of our homes! Turfgrass absorbs the heat of the sun on hot sunny days and actually cools your home! It reduces reflection of the suns rays and in turn reduces glare and dissipates heat to lower the air temperature. Maintaining turfgrass is environmentally responsible. On top of the atmospheric benefits, turfgrass reduces storm water runoff and erosion. It holds water, increasing percolation through the soil, and filters and cleans it along the way to recharge ground water aquifers. Turfgrass promotes human activity and interaction. A well-maintained lawn is a magnate for activity. We want to walk on it, play on it and just enjoy it with our family, friends and pets. Turfgrass is visually appealing and it gets people outside! It can improve physical and mental health. Your landscape increases property values in your community. And turfgrass is an integral part of creating curb appeal for your home! There are other “miracles” of turfgrass including noise absorption, a natural fire barrier between homes, and lower crime rates. Believe in the miracle of turf grass. Your lawn is a powerful asset to your home! Lawn Care: 5 Reasons why you shouldn’t do it yourself. Search the web and you will find a lot of opinions on the subject of lawn care. One blogger writes that he watched a company spend 20 minutes fertilizing his neighbor’s lawn. He decided to save the $70 application charge and DIY it. Others say “professionals” apply less than recommended to save money. Most advise to Do It Yourself (DIY)! 1. You still need to purchase the fertilizer. A bag will cost you about $40 for a 12,000 square foot lawn. And add the cost of weed and insect control. Do you spray Round Up in your hardscape? 2. Add the cost of a spreader. Face it, those Scott’s spreaders rarely last more than a season. And Scott’s likes it that way! If you are willing to buy a commercial grade spreader, it’ll cost you $300 to $400. 3. You always buy more fertilizer than you need. Unfortunately, fertilizer manufacturers don’t sell bags in the exact amount you need. What’s left winds up sitting in the garage. You plan to use it next time but it absorbs moisture, hardens and just becomes a mess. Government regulations dictate the proper disposal of fertilizers. It’s not as simple as putting it out to the curb. 4. The timing of applications is critical. A couple of rainy days, a family event the next weekend, and you’ve missed the window for applying pre-emergent weed control. Come July, you’ve got a lawn full of crabgrass. 5. DIY’ers may be unknowingly harming the environment! Professionals calibrate equipment to ensure accurate application rates. Many States have laws that mandate when, and how much fertilizer can be applied annually to your lawn. Most homeowners are unaware and have no idea they may be negatively affecting the environment. A reputable professional will quote an exact cost for lawn care service that is inclusive of weed control and insect management. Service calls are typically free and applications are completed on time, at the right time and in an environmentally sound manner. Hire a professional. In the end, you’ll save money!